Mrs. Vassileva joined First Investment Bank AD in 2017 as Director of the Strategic Planning and Development Department. She was subsequently appointed as Executive Director, member of the Management Board of First Investment Bank AD and Chief Retail Banking Officer (CRBO). The professional experience of Mrs. Vassileva in the banking sphere started in 2007 in Eurobank EFG Bulgaria AD (Postbank) as Director, Consumer Lending and Executive Director of one of the group’s companies. From 2010 to 2016 she was Retail Banking Manager at Alpha Bank – Bulgaria Branch. Her career began in 1998 at Coca - Cola Hellenic Bottling Company Bulgaria AD, where she held various management positions in marketing and sales for 6 years. From 2004 until 2007 she was a member of the management team of United Milk Company EAD. 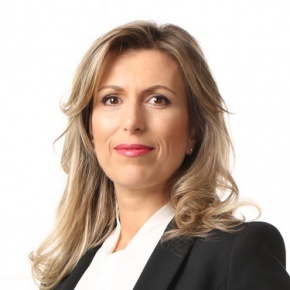 Prior to joining First Investment Bank AD, Sevdalina Vassileva was part of the team of Bella Bulgaria AD, serving as Director of Business Development and Expansion. Outside her strictly professional duties, in her spare time she mentors entrepreneurs and start-ups, assisting them in the development and realization of their ideas, mainly in the field of new technologies. Sevdalina Vassileva is the Chair of the Management Board of the Alumni Association of the Faculty of Economics and Business Administration at the Sofia University St. KlimentOhridski, where she works towards improving the professional orientation and training of young people, as well as promoting the contacts and cooperation between the business, academia and institutions. She is a member of the Ladies’ Forum of Bulgaria, which goal is to establish a base for sharing ideas, experience and information among women, proven professionals in their career field. Mrs. Vassileva has graduated from the Faculty of Economics and Business Administration of Sofia University, with an MBA degree in Management Information Systems. In 1996 she specialized in Marketing and Management at Lund University, Sweden. Besides her position at Fibank, Mrs. Vassileva is a member of the Board of Directors of Diners Club Bulgaria AD and a member of the Board of Directors of Balkan Financial Services EAD.